he has had an unquenchable thirst for flying after having watched a pippy longstocking show last month. 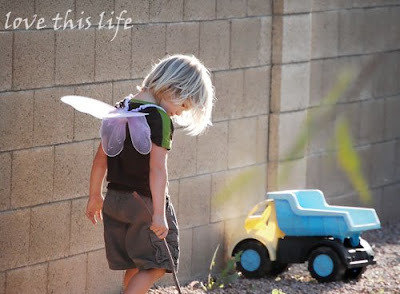 he has been trying ever since, and came up beside me yesterday asking if i could help him put on some wings so that he could go outside and fly. there are so many things about this that touch me so deep. one of them being that we are really learning about how much "failure" brings us closer to our own place of power in this home. me and the children...i see it in us daily. we are coming to know that we must do our own work...and that doing our best, giving our honest effort toward living out our integrity, is the greatest flight of all. he will keep trying to fly. i know this about him. and i will watch as he learns the grace of being gentle with himself when he falls. for a few more images of his winged dreams, please do visit here ! this brought tears to my eyes.....knowing his sweet, passionate soul....and his hope....that is all any of us can do....is our best effort....but also to never give up hope. oh my...how i love that little soul. he just doesn't know that he ALREADY knows how to fly. he soars actually.